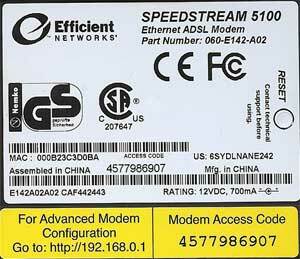 The Advanced Modem Configuration sticker shows an address. Type this address into a web browser to gain access to the modem. On the other yellow sticker, note the Modem Access Code for later use. Type the address from the yellow sticker into a web browser (usually 192.168.0.1). Click the Login button on the left menu. If the connection is currently connected, you may have to click the Disconnect button. You may be prompted to enter the modem's access code. Enter the code on the yellow sticker on the bottom of the modem. When complete, click the "Connect" button. The DSL connection should be ready to use. Browse to http://www.toast.net/start to verify the connection is working. Your Speedstream modem is now setup for TOAST.net.